What do Drake, Ninja the professional esports player, Kim Dotcom, Travis Scott and NFL player JuJu Smith-Schuster have in common? They’re all playing Fortnite together right now and live-streaming it on Twitch . Yes, seriously. You can tune in to Ninja’s channel here to check out the action. Right now the amount of live viewers is hovering around 600,000 which smashes Twitch’s previous record of 388,000 live concurrent viewers. 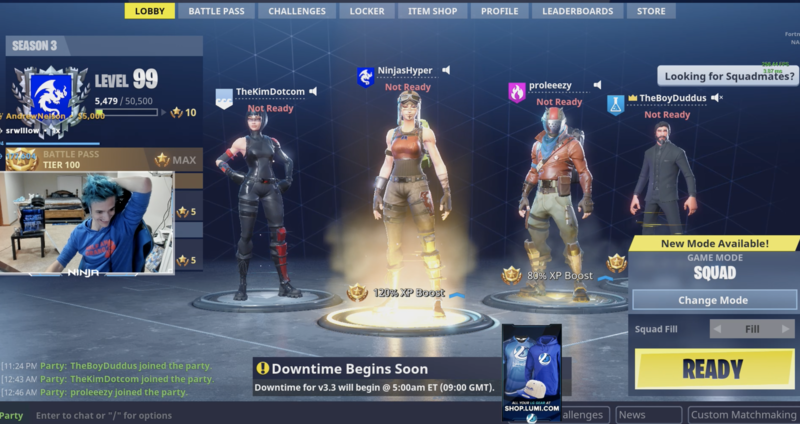 Drake and Ninja started playing together a few hours ago on Ninja’s channel, and were soon joined by the other members as word spread of the livestream. Ninja is playing on a PC while Drake is on a PS4, but the two can play together thanks to Fortnite’s cross-platform support for those two systems. The group had their fair share of technical difficulties – especially when it came to adding new players to their party, mainly because everyone’s friend requests were maxed out. That’s definitely something Epic will to work on if Fortnite continues to be the preferred game of celebrities and athletes. In all seriousness, it’s a big moment for esports and livestreaming in general. The fact that mainstream celebrities are not only spending their time playing (and talking about) massively popular video games, but doing it live so hundreds of thousands of others can watch is a huge validator for the future of the two industries and companies like Twitch and Epic Games . As you can imagine, Twitter is going insane and we’re already getting some amazing memes. Oh, and one more thing. Epic Games (the company that created Fortnite) is supposed to take down the game’s servers at 2am PT / 5am ET. Anyone want to bet that they’re going to reschedule?